Yet another concert at the 9:30 club, this time we get to see Blaqk Audio, a collaboration by two members of AFI, Davey and Jade. 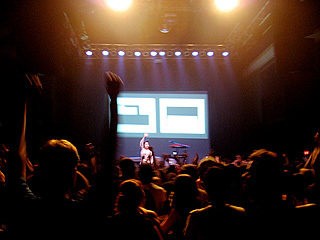 With new wave/electronica music reminiscent of Depeche Mode, I was very excited to see how they would perform. They did not disappoint. 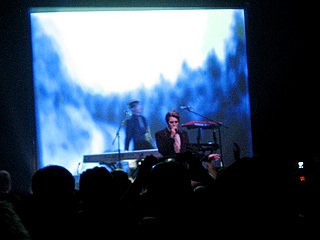 Davey's voice was beautiful and intense, and they even had a concert setup similar to Depeche Mode with video playing on the big screen behind. With just two members and no instruments other than their voices, keyboard and a synthesizer, it's quite a good thing frontman Davey has an awesome stage presence. Jade, even though elevated in the back, also exudes quite the presence as well. I may have taken more photos, but the band requested that no photos be taken. I discreetly just took these three. Again, opted for the floor instead of the balcony to be more in the mix, but also to be able to dance around, which I was able to all the way in the back since there was room there. It was cool that I could still see them between the heads in front of me and move up a little if I wanted to. One of the best things about new bands - not-so-packed venues. Here's the setlist, in no particular order. They sang practically all but maybe 2 songs off their new album, Cex Cells. Wake Up, Open The Door And Escape To The Sea - maybe? They also did an awesome cover of Blur's "Girls and Boys" with both Davey and Jade singing. Where we were standing, I was the only one who knew all the words to that song, which was released in '93 - definitely a sign of my age. 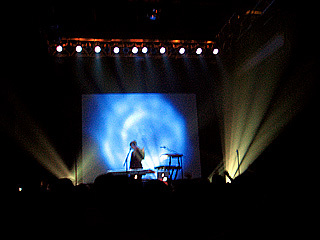 Aside from the last two songs, which were posted on their myspace page, my two other favorite perfomances were "Between Breaths" (so mesmerizing, like being in a trance) and "Snuff on Digital"
Definitely looking forward to more of their work in the future. i see that you updated your blog with all or almost all of those old entries! yay ruby. all of your photos look awesome and it sounds like you're having fun in dc. miss you.